Chlorhexidine immediate antimicrobial activity is slower than that of alcohols. It has good activity against Gram-positive bacteria, less activity against Gram-negative bacteria and fungi, and minimal activity against mycobacteria. It has both bacteriostatic and bactericidal mechanisms of action, depending on its concentration. Chlorhexidine molecule has in vitro activity against enveloped viruses such as herpes simplex virus, HIV, cytomegalovirus, influenza, and RSV, but significantly less activity against non-enveloped viruses such as rotavirus, adenovirus, and enteroviruses. Chlorhexidine has demonstrated some effectiveness against microorganisms in other forms and states including bacterial spores and protozoa. Chlorhexidine has shown some ability to help inhibit adherence of microorganisms to a surface thereby preventing growth and development of biofilms - one of the most dangerous complex aggregation of microorganisms. The antimicrobial activity of chlorhexidine is not seriously affected by the presence of organic material, including blood. Chlorhexidine application shows limited risk for the development of an opportunistic infections. Because chlorhexidine is a cationic molecule, its activity can be slightly reduced by natural soaps, various inorganic anions, non-ionic surfactants, and hand creams containing anionic emulsifying agents. Chlorhexidine has a positively-charged molecule that binds to the negatively-charged sites on the cell wall. The bacterial uptake of the chlorhexidine is very rapid, typically happens within 20 seconds. Chlorhexidine affects the integrity of the cell wall. 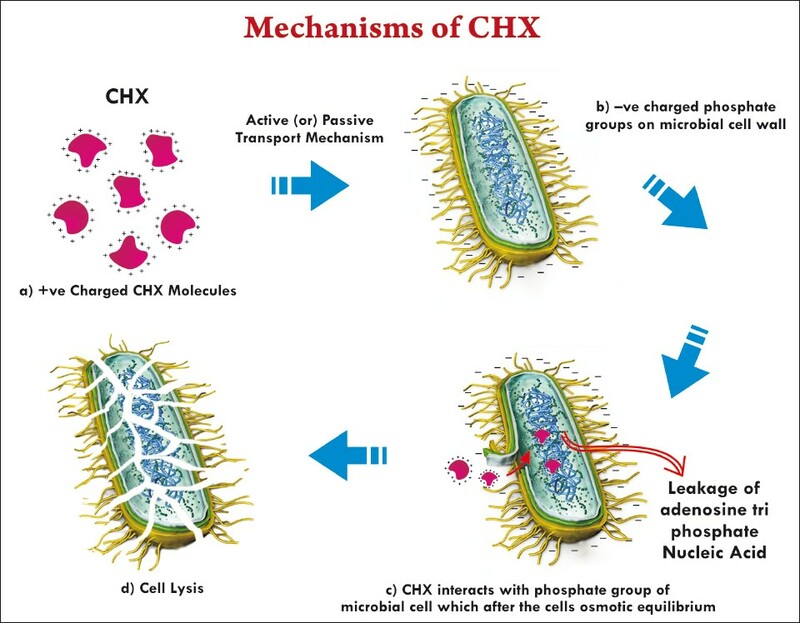 In high concentrations, chlorhexidine causes the cytoplasm to congeal or solidify. Chlorhexidine has significant residual activity: it is shown to have the ability to bind to the proteins present in skin and mucous membranes with limited systemic or bodily absorption. Protein bound chlorhexidine releases slowly leading to prolonged activity. In oral applications, chlorhexidine binds to the mouth tissue. It is then released over time. This helps to reduce the bacterial count and prevents dental plaque. Chlorhexidine has become the gold standard in dentistry due to its ability to adhere to soft and hard tissue and maintain a potent sustained release.